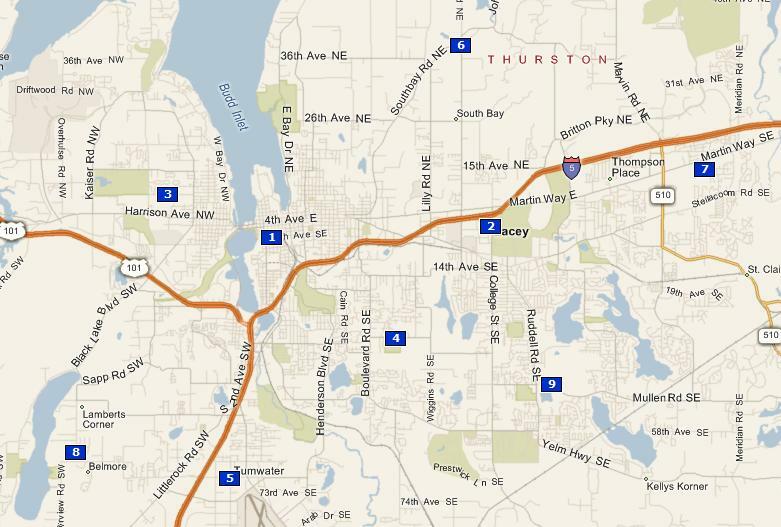 The numbers 1, 2 and 5 are the current locations of the Timberland Libraries in northern Thurston County. The other numbers include several schools in all three districts (Olympia, North Thurston and Tumwater), including Capital (#3), Timberline (#9), and River Ridge (#7) high schools and a few elementary schools (including McKenney [#4] down in my neighborhood). I've been reading about libraries and schools a lot lately. Mostly about how libraries can become "centers of civic life." I've also gone over some interesting stuff about how schools can serve the same role simply by staying open longer and becoming informal "Third Places." Anway, the Timberland system in the last few years has opened several "Cooperative Library Centers," which are public libraries in school buildings. Combining the public space of a school with public library services builds on the mission of both organizations of public education. It also creates a more vibrant civic space in a building, that in many rural communities, is already the center of the community. In Timberland's more urban communities, especially Olympia, we've had trouble building new facilities. The last library bond, for a new downtown Olympia library, was voted down back in the mid-90s. But, the Olympia school district has a very good track record of passing levies. Why not team library service with school buildings? Expand the current space for library services (even if its limited to one Westside Olympia school), expand community involvement in schools, and expand civic space.